Scratch is a new programming language that makes it easy to create your own interactive stories, games, music, and animations—and share your creations on the Web. 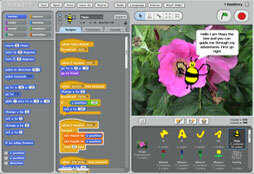 Scratch is developed by the Lifelong Kindergarten group at the MIT Media Lab, with financial support from the National Science Foundation and the Intel Foundation. 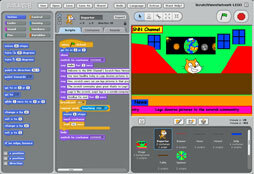 The software is available free of charge from http://scratch.mit.edu.